This post first appeared in March, 2013 at Ecotwaza.com, a lovely little company here in Japan dedicated to sharing the joys of Japanese culture, where I wrote a monthly column. The aftermath of a natural disaster is no simple affair. Even in Japan, a country long accustomed to earthquakes and the tsunamis that inevitably follow, there is an element of unpredictability. The 9.0 magnitude quake that struck on March 11th, 2011, brought with it a tsunami the likes of which had not been seen for 500 years. That was long enough to forget the warnings of previous generations and trust man-made barriers to protect shoreline communities. Still, it was the nuclear wild card that threw this country of calm and order, the one most prepared for such kinds of calamities, into new realms of environmental degradation, community displacement, and crisis management. For those living in Tohoku, the northern region of the country directly impacted by this triple calamity, the catastrophe lingers two years later as a dull ache of temporary housing, economic crisis, and energy turmoil. 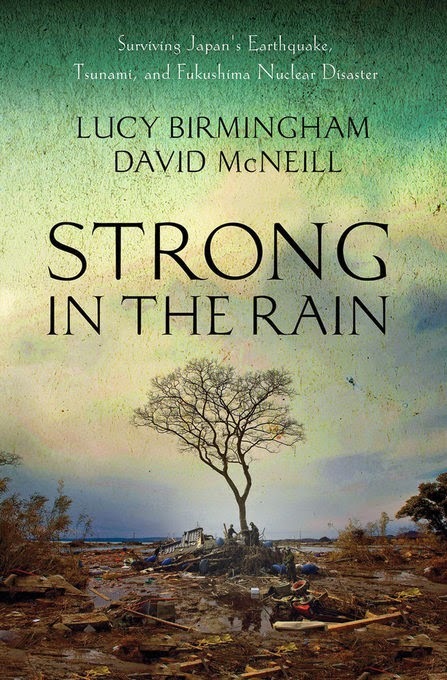 Strong in the Rain by Birmingham and McNeill (2012) introduces readers to six survivors, each representing a particular segment of Tohoku. Readers meet a fisherman whose first instinct took him to his boat and the sea to avoid the tsunami; a school teacher who fought the tsunami to help others survive as the water inundated the gymnasium where they waited; a nuclear power plant worker who readily returned to his job despite the risks; a high school student who barely escaped the tsunami with his family; a mayor who struggled to bring his city's plight to the attention of the world; and a nursery school cook who helps her young charges to safety only to return to the unrecognizable landscape of her city to begin the search for her own loved ones. Some are famous, like Mayor Sakurai of Minami-soma whose city lies twelve miles from the ailing power plant. His cries for help via YouTube echoed around the world and brought the world and it's helping hands to his ailing city. Others, like Kai Watanabe (a pseudonym), a nuclear power plant worker who returned to the plant again and again out of a sense of duty to his company, community, and country, remain unknown. Readers meet each one the morning of March 11th, by all accounts a bright sunny day with snow predicted for the afternoon, as they finish breakfast, head to work or school, and say goodbye to loved ones. It is, of course, the middle of that afternoon that forever changes their lives, destroying homes, stealing loved ones and livelihoods in a few moments. It is also from that moment that Birmingham and McNeill set about unraveling the tangle of events, people and issues which become the March 11th triple disaster. Alternating personal stories with official accounts and scientific information, a picture of a geologic and environmental disaster layered against a complex background of history, politics and culture becomes clear. The pattern that emerges as these threads are woven together is one of brave citizens fighting the same battle their ancestors did against a government and corporate culture that often appears ready to take all they can with little regard for the consequences. The book could almost be called “The Places in Between” for all the gaps it charts in the landscape of the unprecedented triple disaster. McNeill and Birmingham guide us through the tightly entangled relationship between TEPCO, the company that owns and operates the nuclear power plant, and politicians and money that continues to muddy the waters of recovery and investigation today. We also witness the shocking failings of the Japanese media, government, and most of all, TEPCO. Journalists, ordered out of the area by their companies and at risk of losing their jobs if they returned, left the citizens of Fukushima alone at a time when their story most needed to be told. Foreign journalists, often with little or no knowledge of the country, culture, or region, eagerly filled in. The exaggerated reporting that often resulted brought attention to the regions plight but further muddied the waters surrounding an already chaotic situation. Meanwhile, Japanese media and government officials faithfully listened to and believed TEPCO's reports that everything was under control. Until, that is, the moment of the first explosion. Taking its title from a poem by Iwate poet Kenji Miyazawa, the themes of duty and community responsibility pervade. Touted again and again as a region epitomizing much of what Japan considers best about itself: sacrifice, perseverance, loyalty, and humility, each turn of the page introduces people who show what the human spirit is capable of even in the worst of times. These six are joined by other survivors who helped settle fellow community members settle in temporary housing or identify recovered bodies. Readers also meet others who come to lend a hand, ranging from the Tokyo firefighters who volunteered at the plant in the earliest days of the crisis; members of Japan's Self-Defense Forces who scoured endless fields of debris for personal mementos, the injured, and those beyond help; and more. Birmingham and McNeill's time spent in the region interviewing and visiting sites as well as researching its history and culture shape a compelling narrative of the events as they played out following that fateful moment two years ago. They weave the threads of loss, politics, and perseverance into the context of national as well as regional culture and context to present a clear picture of the crisis, its immediate aftermath, and how the decisions made then rippled out to Tohoku and beyond. Readers are also left with a feeling of hope, however feeble, that perhaps Japan will take this opportunity to move forward to safer, sustainable methods of energy creation. For the sake of those we meet in these pages and beyond, let's hope they do.